As I feared, Fantasy Flight Games is releasing miniatures at a glacial pace for Imperial Assault, their Star Wars skirmish game. I am not by nature a patient man - just ask Mrs. Oldenhammer in Toronto as the cocktail hour approaches. And so I've decided to take matters into my own hands and create some new miniatures of my own. I'm not much of a sculptor, so this was an adventure for me. 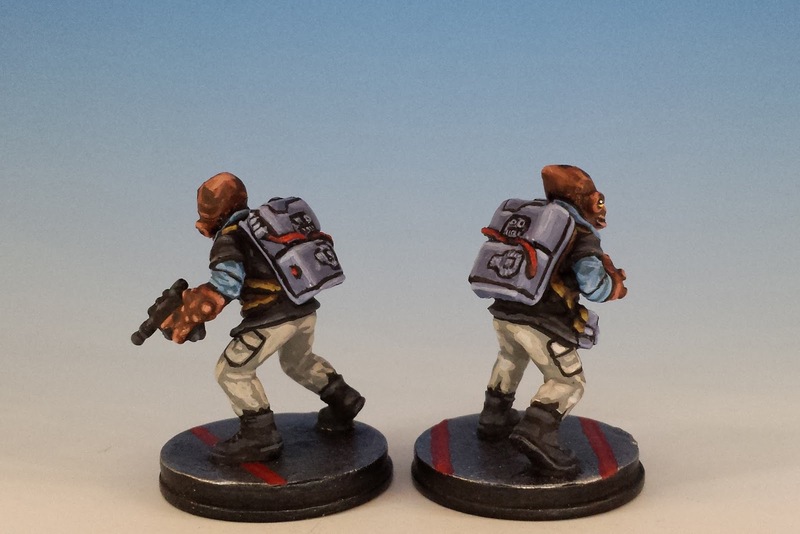 I started with a unit of two Rebel Saboteurs. 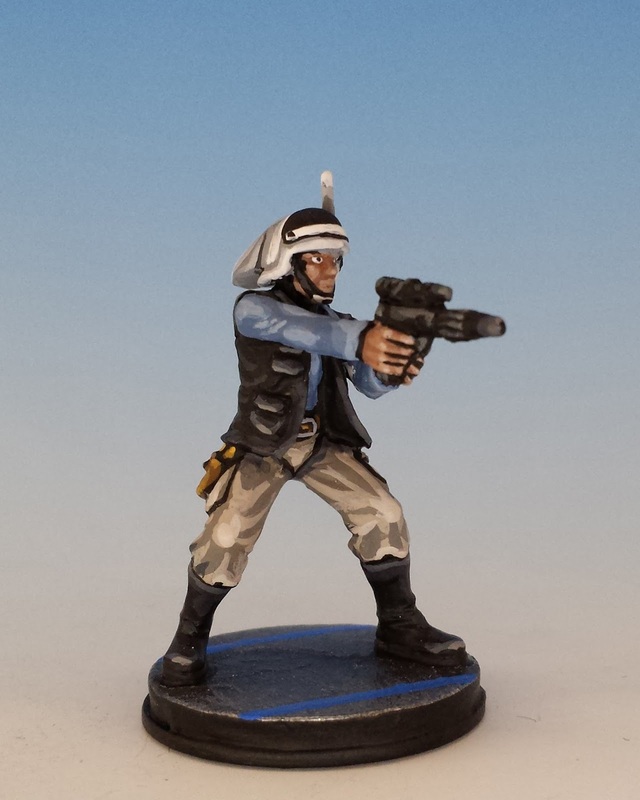 I chose them because after a few weeks of competitive play, it's become clear that they are the best troops in the Rebel's roster. Screw the Force: if you're going to stop Darth Vader, you need the withering firepower of these commandoes. In fact, the only time I've seen Darth go down, it was because my opponent fielded 8 Rebel Saboteurs who swarmed the Sith Lord like a plague of locusts on the coasts of Egypt. 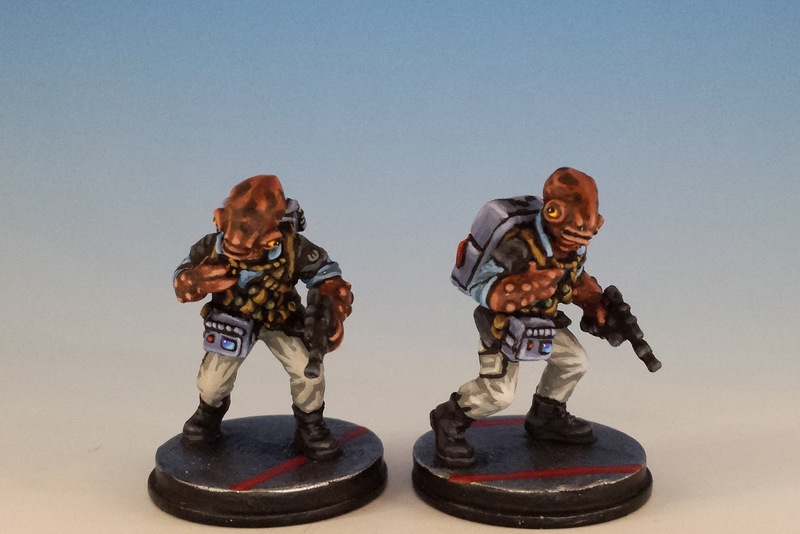 So my plan is to use these conversions as the heart of my own Rebel strike-force. Next, I wanted to replicate the distinctive hands (fins?) 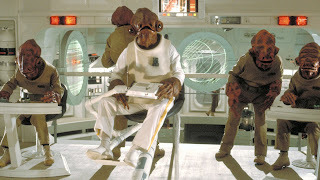 of the Mon Calamari. So I shaped a little Greenstuff into their swollen, rubbery fore-arms and garnished them with tiny polyps. Finally, I refashioned the Durosian hands into claws. Presto! A new miniature. I painted the Mon Calamari with the same colour scheme as my other Rebel forces - a buff, blue and black uniform based on the troopers aboard the Tantive IV at the beginning of A New Hope. 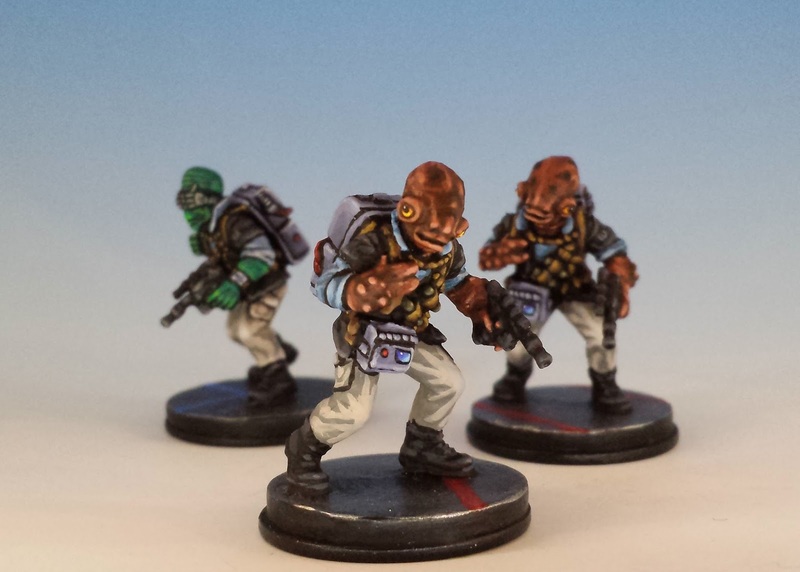 The Mon Calamari skin is Terracotta, highlighted with ruddy fleshtones and capped with some dark brown spots, like port-wine stains. I've ordered a heap more Wizards of the Coast figurines, so I'm looking forward to more conversions in the future: Quarren, Aqualish and Ithorians... oh my! Thanks for looking! 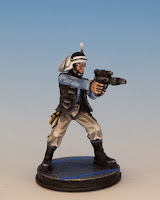 If you've made any Star Wars conversions of your own, please let me know in the comments and I'll happily update my post with the link! "It's a...!" No, I won't be going there. But that is some excellent sculpting! Wow wow wow those are spectacular. I thought they looked great even before reading your post. *Very* impressive work with the conversation et al. I think some of the standout paint points for me are the skin, eyes, and pants. Thanks all! I really appreciate the feedback. Working with greenstuff puts me truly in awe of those who are able to make an entire miniature. I find carving a couple claws and polyps an incredible challenge - god bless all the true sculptors. Drive by comment: Those are excellent. I thought they were repaints at first, and reading that you sculpted those hands... very good work there. Great work on the hands, and the WOTC heads blend in really well! 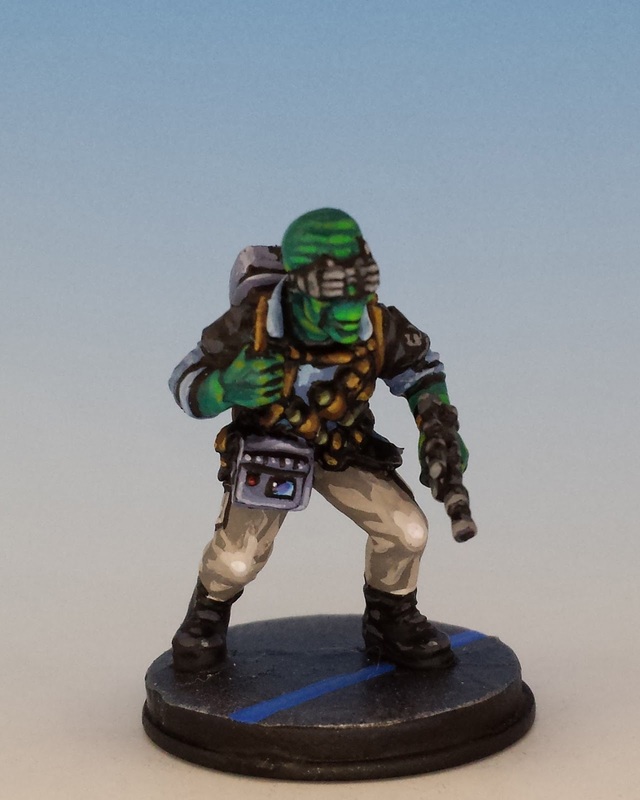 I'm looking forward to doing more WOTC conversions... I've built up a little stockpile of alien heads. No one can be repelled by a conversion of that magnitude! This mon calamari soldiers , you sell ? Kind of you to ask, Boczek, but they're not for sale. I use them too much! I hope you don't mind, but I am stealing this idea! I love sabs and these make a great unit even better!